The postwar expansion of the national welfare state produced – as a by-product – a sense of national community on the basis of social citizenship rights. European integration, also taking shape over the period of postwar reconstruction, lacked the accompanying moral force of deepening European community integrity. More perversely, the operational logic of intensified market and currency integration from the 1980s on was intent to ensure that member states held their ‘wasteful’ welfare state in check through economic liberalization, monetarism and balanced budgets. The aftermath of Euro crisis (and Brexit) has exposed that the ‘permissive consensus’ of relegating social policy to the nation state and market and monetary discipline to the EU is past its prime. However, I doubt that adding substance to EU social citizenship is a viable strategy in times of resurgent nationalism. I am also not so sanguine that ‘adding stuff’ to EU citizenship would strengthen any sense of European community. Rather, I suggest a more assertive and transformative institutional role for the EU in backing and bolstering the problem-solving capacities of semi-sovereign national welfare states. The EU should transform its modus operandi from a ‘disciplining device’ to a ‘holding environment’ for national welfare states to prosper, making the EU a proud and tangible union of national welfare states. 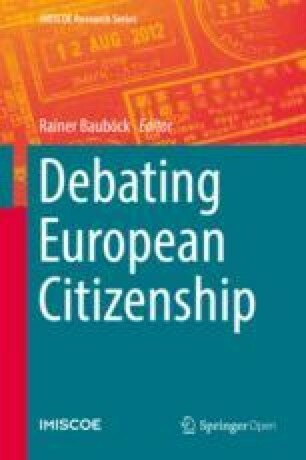 Maurizio Ferrera has written an important and timely response paper to Rainer Bauböck’s call to ‘add stuff’ to EU citizenship. Standing on the shoulders of the equally perceptive and nuanced ideas on citizenship rights by T.H. Marshall, Ferrera ventures to explore the political space for raising, in an incremental fashion, elements of ‘social’ citizenship to the level of the EU, in full recognition of the overriding significance of the member states as the principal providers and guardians of highly diverse welfare benefits and services. Ferrera, like Marshall before him, believes that social citizenship does not only provide individuals with an elementary right to economic opportunity and security, through poverty relief, universal access to health care and education, labour market services, unemployment, sickness and old age insurance, but that social citizenship also encourages a sense of community membership and belonging, referred to by Marshall as sharing ‘to the full in the social heritage and to live the life of a civilised being according to the standard prevailing in society’.1 It is this sense of moral integrity and community loyalty, historically an important (by-)product of national welfare state building, that the EU sorely lacks. More perversely, it has been argued, among others by Fritz Scharpf and Wolfgang Streeck,2 that the intricate connection of EU citizenship to free movement in the internal market and, for the Eurozone, budgetary rules setting limits to discretionary fiscal reflation in times of demand-deficient unemployment, in effect undermines national welfare state capacities to maintain social citizenship achievements, won over decades of national political struggle for the improvement of people’s life chances and the protection of vulnerable citizens – the aged, the sick, the unemployed – from economic, social and political marginalisation. Bauböck’s rejoinder to Ferrera’s opens by explicitly acknowledging that EU citizenship was conceived ‘by stealth’ by the Court of Justice of the European Union (CJEU) in the slipstream of the Maastricht Treaty. The political objective at the time was to seal the internal market with the single currency. As these institutional breakthroughs were negotiated at a time when the ‘supply side’ revolution in economic theory was riding high, their architects generally believed that the Single European Act (SEA) and the Economic and Monetary Union (EMU), and associated budgetary rules, would force member states to keep their ‘wasteful’ welfare states in check. Indeed, the primacy of internal market, together with the prohibition to revert to currency devaluation in times of mass unemployment for the Eurozone, constrained national social citizenship regimes, ‘by stealth’. Frank Vandenbroucke’s post-hoc legitimation, with reference to John Rawls, prioritising ‘fair equality of opportunity’ over the ‘difference principle’ of distributive justice, implicitly assumes a well-delineated European polity that is able to work out an explicit compromise between these two principles. The EU is not really a political union in terms of democratic self-determination, although it is currently experiencing growing pains to that effect. Its borders change with each wave of enlargement and now it is confronted with a first case of withdrawal. It is tragically ironic that the United Kingdom, whose governments in the past have been the strongest force behind the internal market and enlargement and very vocal in scorning Europe’s social dimension, has decided to leave the EU on the sentiment that open markets have gone too far. More to the point, the deepening of European economic integration of the 1990s was never presented as an explicit citizenship regime change to national electorates. Market integration and the liberalisation of public services was the EU’s primary raison d’être – think of the Bolkestein directive. Leaders at the time of the Maastricht Treaty sold the internal market and the currency union as a way to enlarge the economic pie for domestic welfare redistribution. Writing in the late 1990s, Fritz Scharpf already conjectured for the then 16 EU member states that regulatory competition, especially in the area of corporate taxation, was impairing the economic viability of national welfare states, while (welfare) migration, under the EU’s freedom-of-mobility rules, would damage their political viability.3 We know that Scharpf’s dystopia of ruinous competitive social dumping has not come true for two important reasons. The first is that most of the successful European economies, according to the Global Competitiveness Index of the World Economic Forum (2014), are high-spending welfare states, including, Finland, Germany, the Netherlands, and Sweden, with levels of social spending hovering between 25 per cent and 30 per cent of GDP. At a minimum, the evidence that high social spending does not per se hurt competitiveness, presses us to consider the quality rather than the quantity of social spending in trying to better understand the relation between welfare provision and economic prosperity in rich democracies. The second reason is that the deepening of the internal market has been accompanied by a considerable expansion of EU cohesion policy, breakthroughs in social security coordination and important secondary legislation and CJEU jurisprudence, referred to by Suzanne Schmidt, on health and safety, anti-discrimination, equal pay and equal treatment, part-time and temporary work, and parental leave, modelled generally after the better performing countries rather than the lowest common denominator. But with the latest 2004 and 2007 waves of enlargement, in conjunction with the Eurozone fallout of the global financial crisis, magnifying asymmetric shocks without any measure of burden sharing or collective re-insurance, trapping Eurozone debtor countries in ‘bad’ economic and socially imbalanced equilibria,4 we have to sadly acknowledge that Scharpf was pretty much on the mark. In the current predicament, electorates continue to hold national politicians accountable for socio-economic (mis-)fortune, not EU institutions. With political accountability bound up with popular welfare states, it is particularly difficult to renege on established social contracts in hard economic times. In addition, the failure to resolve the euro crisis at the supranational level has increasingly been met by rising Eurosceptic domestic pressures to water down ruling governments’ commitments to European solutions, especially in the politically sensitive policy areas of welfare provision. It therefore comes as no surprise that today anti-EU right-populist parties are the most ardent defenders of the post-1945 social contract for ‘natives’ only, proclaiming that retirement at 65 can be sustained through protectionism, a ban on migration and by bidding farewell to the internal market and the single currency. On the other hand, Eurozone crisis management hardly departed from the deeply entrenched worldview, anchored in the Maastricht Treaty, that generous welfare provision harms competitiveness. Fiscal conservatives, including Northern social democrats, have championed intrusive cost-containment in exchange for fiscal bailouts, in the Eurozone periphery, to make up for a lost decade in ‘structural reform’. Mario Draghi, being interviewed by the Wall Street Journal at the height of the Eurocrisis in early 2012, similarly declared the ‘European social model’ as ‘long gone’. Between right-populist welfare chauvinism and on-going calls for overnight fiscal consolidation, a ‘political-institutional vacuum’ has emerged at the heart of the European project. Even if populist parties do not enter office, to the extent that they successfully portray a nostalgic image of a national welfare paradise lost as a result of globalisation and mass migration promoted by the EU, mainstream parties, in- and outside of government, face severe difficulties in claiming credit for making national welfare states more future proof through improvements in family welfare in return for a higher pension age. The Juncker Commission has taken on an ambitious number of social policy initiatives, including the Youth guarantee, the ErasmusPro initiative for cross-border initiatives, the New Skills Agenda for Europe, the European Pillar of Social Rights,5 the Social Scoreboard for assessing progress towards a social ‘triple A’ for the EU. Most of these initiatives are being pursued in a seemingly uncoordinated manner, without an overall ideational framework or policy paradigm. What’s more, time and again, concerns about inequality, poverty and mass (youth-)unemployment are relegated to ‘auxiliary’ status and remain subordinated to the Six-Pack (2011), the Fiscal Compact (2012) and the Two-Pack (2013),6 prescribing balanced budgets irrespective of urgent needs. As a consequence, and in spite of the post-crisis lip service paid to social investment by the European Commission, the ‘default’ policy theory of market liberalisation, balanced budgets, hard currency, and welfare retrenchment has not been questioned. With high (youth) unemployment, rising poverty and inequality as the breeding grounds for xenophobic populism and Brexit-type political contingencies, the EU and its member governments have to break with the ‘permissive consensus’ of relegating social policy to the jurisdiction of the nation state, under the proviso of ‘subsidiarity’, and market and currency regulation to the EU, as if this conjured up a ‘happy’ equilibrium. It does not. And here lies, as Maurizio Ferrera makes crystal-clear in his essay, the fundamental political reason why adding ‘social’ stuff to EU citizenship can no longer be dismissed as wishful dreaming. Indeed, a transformative turn, in the conceptualisation of Paul Magnette, from the ‘isopolitical’ citizenship right of free movement and the destabilising externalities of the Treaty to the ‘sympolitical’ re-confirmation and enlargement of EU social citizenship, is imperative. The isopolitical limitations of EU action in the social domain have to be confronted on two fronts: 1) in terms of political priorities threatening the very legitimacy of the European project, and 2) in terms of sound comparative evidence of how dynamic social policies can help achieve prime EU political objectives of growth, jobs, competitiveness and social inclusion. Before we move forward, there is an important caveat to be discussed. The effective delivery of social citizenship rights implicates state steering capacity, not merely regulation. Civil rights, rights to property and respect for the rule of law are operationally precise and can, as such, more easily be enforced. However, today the European Commission is unable to retroactively uphold the Copenhagen accession criteria, which Hungary and Poland accepted when joining the EU, for the likes of Viktor Orban and Jaroslaw Kaczynski, further weakening thereby the legitimacy of the EU in many member states with strong commitment to the rule of law. Social rights, defined in terms of substantive need, are of a different breed altogether. The right to a minimum income, which is in the words of Marshall ‘not proportionate to the market value of the claimant’, obliges the political community to interfere with and modify the distributive consequences of cyclical and volatile market processes. This requires ‘positive state capacities’,7 both in terms of ‘bending’ market processes through taxation and compulsory social insurance contributions and also through provision of benefits and service delivery, which the EU, as a mere regulatory regime, in the words of Christian Joppke, lacks by deliberate intention. Consequently, the question of ‘how much’ is good enough, and ‘what kind of benefits and services’ are required, on behalf of ‘what categories of (deserving) citizens’, and ‘at whose expense’ are fundamental political questions, which, for the time being, cannot be settled at the level of the EU. I am in full agreement with Maurizio Ferrera’s diagnosis of the post-crisis EU social malaise, imbalance and contradictions and the need for the ‘sympolitical’ change of heart that he suggest. When it come to policy proposals, Ferrera opts essentially for a ‘compensatory approach’ that aims at de-activating the (perceived) disintegrative dynamic of EU civil citizenship undermining domestic social citizenship regimes, by focusing on policy support for the so-called ‘stayers’, those who do not exercise free movement rights. Ferrera wants to empower them through services and benefits that help to mitigate the disruptive effect of EU economic integration on national labour markets and welfare regimes. Ferrera’s proposals immediately beg the questions of ‘who to compensate?’; ‘for what exactly?’, ‘how much?’, ‘through which kind of benefit or service?’, and ‘who is to pay?’ for the new policy provisions. And ‘what about other losers?’, such as countries suffering a brain-drain of their college graduates under conditions of high youth unemployment, reinforced by the Eurozone austerity reflex? I am also doubtful, at this current juncture, that we will really be able to identify and measure the bewildering complexity of the negative externalities at play through improved policy-evaluation, as suggested by Julia Hermann. And whether ‘adding stuff’ through a compensatory enrichment of EU social citizenship would strengthen a European sense of community is another open question. Although I concur with the general sympolitical re-direction of the substantive initiatives Ferrera puts on the table, I would rather pursue a more roundabout gradualist route to EU social citizenship progress, whereby the EU would assertively back and bolster the problem-solving capabilities of semi-sovereign national welfare states, rather than compensate perceived losers from economic integration. Rather than moving towards a broader Social Union, as suggested by Andrea Sangiovanni, I plead for an EU support for national solution that allows the nation states to better perform their welfare functions of social protection and social promotion in their highly diverse domestic jurisdictions. If successful, EU support for national welfare provision could very likely reinforce popular loyalty to the EU as a common possession of a union of welfare states. But I am not sure whether it is essential for the EU to claim political credit, as Maurizio Ferrera intimates. In this respect, I guess, I am in-between Ferrera’s supranational stance of and Richard Bellamy’s inter-national position. In my monograph Changing Welfare States,8 I coined the notion of an assertive ‘holding environment’ as a quintessential EU support structure for (active) welfare states to prosper in the single market and the currency union. The notion of a ‘holding environment’ refers to a zone of resilience based on shared values and a common purpose, matched by competent institutions, in times of painful adaptation. The function of a ‘holding environment’ is to mitigate stress and thereby uphold the integrity of national welfare states, but also to maintain pressure to mobilise rather than overwhelm domestic reforms with only disciplinary intrusion, and to back up progress on tough problems with light at the end of the tunnel. The ‘holding environment’ for sustainable welfare provision, contrasts sharply with the notion of the single market and the single currency as intrusive welfare state ‘disciplining devices’. There is important progress underway. In terms of shared values, the presentation of a European Pillar of Social Rights by the European Commission is an important step forward in comparison to the more ambivalent ‘social market economy’ ambition laid down in Articles 2 and 3 of the Lisbon Treaty. The Social Pillar recommendation of the Commission sets out 20 key principles, defined in terms of rights in support of fair and well-functioning labour markets and welfare systems. The Social Pillar, likely to be endorsed by the European Council at the Social Summit for Fair Jobs and Growth in Gothenborg on 17 November 2017, is a good example of the articulate translation of the latent commitment to social solidarity that the EU member welfare states, in spite of their many differences, share in terms of key principles without interfering deeply with the division of labour between member states, social partners and the EU. All in all, the 20 principles cover a well-balanced portfolio of ‘fair-playing-field’ social and employment regulatory provisos, including equal treatment, gender equality, work-life balance, health and safety, minimum wages and social security rights. The latter comprise unemployment benefits, old age pensions, social protection and health care. Significant attention, moreover, is devoted to ‘capacitating’ social rights, such as the right to essential service, inclusive education and training over the life course, active labour market policy support, childcare and family benefits, the inclusion of people with disabilities, long-term care, and housing assistance. These echo the 2013 Social Investment Package for Growth and Social Cohesion of the Barroso Commission, urging EU Member States to advance post-crisis welfare reform strategies that help ‘prepare’ individuals, families and societies to respond to the changing nature of social risks in advanced economies by investing in human capabilities from early childhood through old age, rather than pursuing policies that merely ‘repair’ social misfortune after moments of economic or personal crisis. The Pillar principles, articulated as rights, can come to serve as a reference framework to fundamental values that the EU and the member states share. As such, the Pillar may well enhance a sense of community membership. However, for an effective sympolitical ‘holding environment’, European initiatives that make a contribution to strengthening the problem-solving capabilities of national welfare states, it is quintessential to ensure that the Pillar is not an empty shell. More tangible EU institutional support is called for to uphold and back up the integrity of national welfare states. Back in 1999, Fritz Scharpf had the ingenious idea of introducing an EU agreement on not reducing overall social spending relative to GDP, so as to pre-empt ruinous competition among European welfare states, leaving the member states at liberty to decide on levels of benefits and services, modes of delivery and financing techniques through national democratic processes, but not for the purpose of economic competition. If such a rule had been adopted at the time, to be sure, the social and political consequences of some bailout programs administered by the Troika of the EU, the ECB and the IMF would have been less socially disruptive, especially in the case of Greece. A more recent proposal for the Eurozone is to introduce a ‘re-insurance scheme’ for national unemployment insurance systems. The idea is that unemployment insurance is a core feature of national welfare states with a highly effective macroeconomic stabilisation component and with uptakes increasing during downturns when resources are constrained by the need of fiscal consolidation. A pan-Eurozone unemployment re-insurance scheme would provide more fiscal breathing space for countries asymmetrically affected by the downturn, which in turn could trigger faster and stronger recovery (see also Vandenbroucke’s contribution). If we consider the three policy functions in terms of a viable division of responsibilities between the EU and the member states, then clearly the function of social security buffers, as the core function of the modern welfare state, jealously defended by domestic political actors, should remain in the remit of the national welfare state. If France and Italy, through democratic processes, agree to spend most fiscal resources on pensions, this may not be wise in the light of adverse demography, but there is very little that a supranational organisation can do, except to advocate that sustainable buffers are in the long run best served by investing in future productivity. The flow function, concerning labour market regulation, collective bargaining, work-life balance and gender equality with a aim of fostering adaptable family-friendly employment relations and careers in the knowledge economy, can be well served by mutual learning and monitoring processes of open coordination, engaging national administrations and relevant EU expert committees and the social partners.10 The experience of the crisis, especially the Eurozone austerity reflex, has resulted in a public investment strike, most unfortunately in the area of human capital stock capabilities, lifelong education and training, with significant negative consequences for future growth, employment and productivity in knowledge economies facing adverse demography. If the European Union is considered the trade union of the next generation, as Mario Monti allegedly intimated, then surely the EU, with a youth unemployment rate close to 50% in Spain and Greece, is not doing a good job in terms of interest representation and collective action. Granting more fiscal room for manoeuvre (within bounds) to countries that experience excessive social and macroeconomic imbalances would enable them to secure sustainable financing of education and skills upgrading before the ageing predicament becomes truly overwhelming. Exempting such investments from SGP deficit requirements would render greater fiscal space to member states that opt for social investment reform, without trampling on Eurozone fiscal rules. For countries struggling to commit to a balanced budget without abandoning their domestic social commitments such exemptions could foster immediate gains in early childhood, female employment, improved work-life balance and reduced levels of early school leaving with positive medium-term outcomes in employment, educational attainment and ultimately pension cost-containment resulting from higher levels of employment. Domestic reform ownership is crucial. That’s why the initiative for proposals lies with national actors. Italy and Spain could opt for the creation of immediate (and primarily female) jobs by making huge investments in high quality childcare centres. France could pursue a radical improvement of its system of vocational education and training based on the Finnish and German examples, while Belgium, the Netherlands and Slovenia could ramp up their rather regressive lifelong learning arrangements. At the same time, discounting human capital stock investments should be closely monitored through the European Semester in terms of effective alignments with labour market regulation and employment relations that help to ease labour market and life course transitions for individuals and families and facilitate strong (universal) social security reform across Euro-member states. Beyond incentivising domestic social investment reform ownership through positive – carrot rather than stick – conditionality, there is a real need to streamline the EU budget to further leverage social investment returns in the European Social Fund (ESF), the Youth Employment Initiative (YEI), the Youth Guarantee, the European Globalisation Fund (EGF), and the European Fund for Strategic Investments (EFSI), known as the Juncker Plan, by giving priority to mitigate cross-border externalities and to positively foster resilient European welfare states. Looking ahead, Europe is in dire need of a growth strategy that is economically viable, politically legitimate and seen as socially fair. Given the magnitude of the hangover from the sovereign debt crisis and the dismal experience of social investment reform in Southern Europe prior to the Euro crisis, there are no quick fixes. The EU must, however, break with the policy legacy of relegating social investment reform to being a ‘handmaiden’ to isopolitical citizenship only – wise to pursue when the economy expands, but prohibited when the chips are down. Only then can social citizenship rights become embedded in a sympolitical ‘holding environment’ that commits, bonds and integrates the EU and the member states to the shared welfare commitment of civilised living in the EU. Marshall, T. H. (1963), Sociology at a Crossroads and other Essays. London: Heinemann, 74. Scharpf, F. W. (2002), ‘The European Social Model: Coping with the Challenges of Diversity’, Journal of Common Market Studies 40 (4): 645–670; Streeck, W. (2014), Buying Time: The Delayed Crisis of Democratic Capitalism, New York: Verso. Scharpf, F. W. (1999), Governing in Europe: Effective and Democratic? Oxford: Oxford University Press. De Grauwe, P. (2011), ‘The Governance of a Fragile Eurozone’, CEPS Working Document no. 346, Brussels: CEPS. European Commission (2017), The European Pillar of Social Rights. Brussels: Publication Office of the European Union. European Commission (2013), Toward Social Investment for Growth and Cohesion – Including Implementing the European Social Fund 2014–2020. Brussels: Publication Office of the European Union. Genschel, P. & M. Jachtenfuchs (2017), ‘From market integration to core state powers: the Eurozone crisis, the refugee crisis and integration theory’, Robert Schuman Centre for Advanced Studies Working Paper 2017/26, Florence: European University Institute. Hemerijck, A. (2013), Changing Welfare States. Oxford: Oxford University Press. Hemerijck, A. (ed.) (2017), Uses of Social Investment. Oxford: Oxford University Press. Zeitlin, J. (2011), Transnational Transformations of Governance: The European Union and Beyond. Amsterdam: Amsterdam University Press.